Check-in is more than just handing a guest a room key. It’s an opportunity to make a guest feel welcome, and to provide the information they’ll need during their stay. Z-CARDs are a perfect addition to the check-in process. Conventional room key holders are useless – most guests just throw them away. Handing them their key in a Z-CARD is a much better alternative for your guests… and your business. Z-CARDs are available with a slot for a room key card. They fit right into the check-in process. Folded, they are pocket-sized. Your guests will find them convenient to carry with them. Z-CARDs are two-sided. Use the front for services and amenities you want to promote. The back is good for general information and maps. Z-CARDs covers make them more durable than conventional folded maps. Your guests will like the novelty. It’s why Z-CARDs are the print people keep, even after their stay. 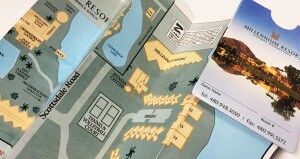 Find out why hundreds of hotels and resorts use Z-CARDs to say “Welcome!” to their guests. Contact us today!